For the epic campaign, see Labyrinth of Ruin (campaign). Dreams of fortune and glory, untamed lands, and old mysteries have brought you to the edges of Terrinoth, near to the ruined city of Sudanya. Little is known of this place and its people, but tales and legends give naught but high allure to the seasoned adventurer. A dark omen shrouds your steps when you first discover the scattered remains of a Dunwarr expedition to these lands. Dead and burned, the bodies of these explorers transform to caution what was once a sense of excitement. Your destination of the Pylia Caravan, formed into an encampment for several weeks of local trade, lies not far on the road ahead. The expedition’s fate forces you to recall many dark rumors regarding the mysterious city. Sinister forces, terrible magic, and a deep seed of evil led to Sudanya’s downfall, or so it is said. Will you unlock the secrets of the forgotten city, or will this grisly scene prove an ominous sign of things to come...? 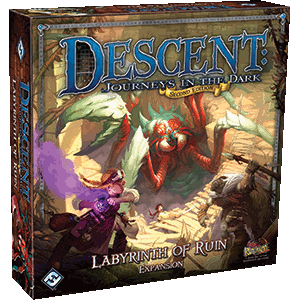 Labyrinth of Ruin is the second expansion to the Second Edition of Descent: Journeys in the Dark. It was first announced on 5. February 2013, and released on 5. July 2013. The new condition added in this expansion is Cursed. All the cards and sheets found in this expansion are marked with the Labyrinth of Ruin expansion icon to distinguish these components from those found in the base game. This page was last modified on 19 February 2017, at 23:09.